Please do not hesitate to contact us for any more detailed information you may need. Moreover, it is our great pleasure to arrange a live demonstration at your convenience. Liquid injection: the unique "rotary" clip liquid injection technology (PCT patent protected in over 150 countries). With transparent liquid injection observing windows, clip usage is under check at any time. RFID technology: RFID chips built-in the clip to help the identification, reading and writing of data through radio signals.Built-in biological incubator to cultivate up to eight. The dual-channel injection by evaporation and purification prevents the liquid hydrogen peroxide from entering into the cabin, thus enhancing the penetration of hydrogen peroxide. so as to ensure uniform distribution of the atomization state of hydrogen peroxide. The Android operating system realizes the precise and effective one-button operation of the entire sterilization process. Ethernet interface and USB interface enables monitoring of the running state of the machine through network; the ?data can be read and downloaded; the materials printed out with its dot matrix printer can be stored for a long time. 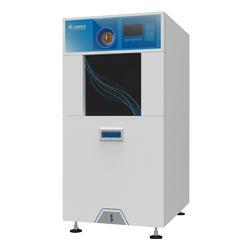 Clip accumulator device enhances the safety; aluminum alloy sterilization cabin has good thermal conductivity, ensuring the balance of temperature in sterilization cabin and enhancing the stability of the sterilizing effect. Control system: controlled by computer, it can self-test failures and save sterilization records for 3 years. Clip: Each clip contains 12 capsules, and each clip can be used for 6 cycles.